THOUSANDS of stars twinkle brightly in the cloudless night sky above me as I rest on a grass bank and look up. A cool, gentle breeze sweeps over my face as I soak in the view. It’s a far cry from the nights in Portsmouth. Private Scott Arnold, of Portchester, who is part of 4 PWRR. This is my second day in Denmark and my first staying out overnight with the men and women of Britain’s newest reserve infantry unit, 4th Battalion, The Princess of Wales’s Royal Regiment. I’m in a mocked-up village called Brikby. It’s packed with brick buildings, roads and narrow alleyways and is being defended by a platoon of about 20 soldiers from C Company – who are based at Tudor Crescent, Cosham. They’ve already been here since the early hours of the morning and are looking visibly tired, under constant attack from a platoon of other soldiers. I’m just about to check my phone when a loud ‘crack’ echoes out from the northern end of the village, followed by another – and then another. It’s just gone 9pm and we were suddenly under assault. ‘Stand to!’, shouts Second Lieutenant Edward Coleman, who comes charging out one of the bungalows next to me, rifle in hand. Troops pour out of the buildings and rush to their defensive positions. I sprint to the north where a firefight is raging. Ducking down behind a car with barbed in front of it, I see Private Gavin Saint engaged in a fierce firefight with an enemy hidden behind a grass mound 50m away. C Company of 4PWRR, who are based in Cosham, return from the exercise. Using his belt-fed general purpose machine gun – GPMG – he lets off burst after burst of automatic fire but he is running low on ammunition. ‘Link, get me more link!’ he screams to his teammates as the enemy fire intensifies. Then his gun jams. Frustrated, he scrambles to fix it while one of his squad mates covers him. To the south west, another group of enemies launch an attack on 2Lt Coleman’s position. The village was now being hit on two fronts. 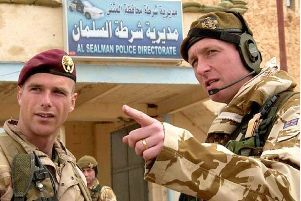 2Lt Chris Keegan, 23, of 4 PWRR. I can just about make out the bright flashes of 2Lt Coleman’s section as they return fire. Beside me, Pte Saint gets up and charges into the woodline 20m in front, that he’d previously used as a static defensive position. He was on a mission to collect more ‘link’ - bullets for his gun. Seconds later he is back behind the car, loading his GPMG and firing before being hit by enemies who had managed to sneak into a building next to him. A quiet computerised voice coming from his kit repeats ‘killed, killed, killed’ every few seconds, having registered a hit from an enemy weapon, equipped with a TES laser system – similar to those used in laser quest. Eventually 23-year-old 2Lt Coleman’s section sweep in, managing to eventually clear the attackers from the building, forcing the enemy to slink back into the night. Thankfully the bullets used were only blanks, operating alongside the sophisticated TES laser system which lets troops know if they would have been killed, wounded or almost hit. But had the toll from this skirmish have been real, it would have been high, with five dead and several others wounded. LCpl Morrison – who by day works for plant and tool hire firm A-Plant in Ford, West Sussex – said this training is vital for troops; it was something he had to use when he deployed to Afghanistan with 1 PWRR in 2011 for six months. ‘I had my 45th birthday under fire on the front line while serving alongside the Danish Army,’ he recalls with a wry smile.‘Believe it or not it was very entertaining. ‘We were under contact and we had a Hellfire missile fired from an Apache helicopter which blew the enemy away and the guys all screamed out “you better blow it out because it is your birthday”. I catch up with 1 Section and the platoon’s commander, 2Lt Chris Keegan who is in charge of the village’s defences. His room is bathed in red light and he is busy writing up orders and assessing how much ammunition is left. The team’s mission is to hold off the ‘British Army’ and defend four key buildings for a day. Despite clearly being tired, he is upbeat about the whole situation and ready for another assault. ‘It’s the excitement and thrill of it all that I love,’ says the 23-year-old, who has ambitions of joining the army as a regular officer next year. Pte Scott Arnold, 36, of Portchester, is part of C Company’s rifle platoon and is in 1 Section. The IT worker says the exercise has been the highlight of the two-week trip to Denmark. ‘This has been very challenging but it’s really helped to cement C Company and get the battalion to come together,’ he says, while resting in a sleeping bag. As the hours whittle away, the enemy seem to have disappeared. Then, just after 4am, a massive attack is launched on the village, again from the north.Flares light up the sky as gunfire erupts in loud volleys. The enemy surge past defensive positions and overwhelm troops guarding the top of the village. As C Company – exhausted and running low on ammunition – scrambles to react in the pandemonium, the enemy begin picking them off. Again, 1 Section tries to reinforce the north of the village but this time they are wiped out by a well-timed enemy grenade as they advance. ‘It was a bit heartbreaking to see all that hard work get destroyed but it was good to see the “goodies” on this occasion – who were acting as the British Army – won,’ says 2Lt Coleman, who works as a project co-ordinator with BAE Systems in Hilsea. ‘They did it and smashed in quickly. They got the job done. He adds: ‘Being on the receiving end of a British Army attack really wasn’t very nice, especially when you’re getting shot at every half an hour.